Here we’d like to share with you a wonderful story, for stories jumped to life at the same time as paintings. This is the Navajo story of First Horse. “When the Holy People first made the horse, it was a complete thing, but it would not come to life. They tried to get it to rise up on its strong legs, but it would not rise. Caterpillar was asked to help. ‘How can I help?’ he asked. “Then the Holy People prayed over Caterpillar and he became Butterfly. Swiftly he flew to the Mountain Where Flint Is Kept. After gathering four flints, he returned to the Holy People and put the flints into the hooves of the horse. The great horse stirred, quivered, and came to life. Then it surged, leaped fully into life, struck the air with its hooves, and galloped off into the clouds. Navajo people believe that there are Five Horses of the Sun Father. And, they believe that they are a way of telling time, Navajo-style. White shell and pearl horses represent dawn, turquoise is noon, red shell is sunset, and jet or coal is night. Stop in at Twin Rocks Café. (You might be able to pick up a copy of the Father’s book.) After you’ve enjoyed your Navajo Taco, stroll out the door and down the path to the Twin Rocks Trading Post. We’d be happy to share paintings by L. Holiday with you – they’re a favorite at our southwest gallery. Enjoy this day of horses and all things mystical and beautiful! Above, watch the video of Mary Holiday Black, legendary Navajo Basket Weaver, speaking with our queen of Twin Rocks, Priscilla. She’s talking with Priscilla about the ceremonial meaning of the vessel and the weaving of it . Big stuff and the conversation of two delightful women. Okay, the video is longer than the media gurus say it should be, but you are watching an artist here, a Navajo icon, a glory and a wonder. Mary Black is largely responsible for the preservation and renaissance of the art of Navajo basketry. She truly is a legend in her own time. Mary received the Utah Governor’s 1995 Folk Art Award and, in September of 1996, she received a $10,000 National Heritage Fellowship Award from the National Endowment for the Arts. It was presented to her in Washington D.C. by First Lady Hillary Clinton. 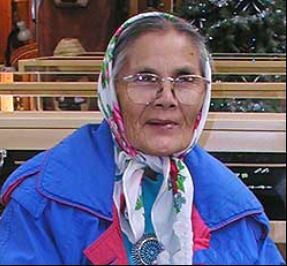 The matriarch of a large and talented family of basket weavers, Mary Holiday Black has preserved the tradition of Navajo basketry. And, she has revolutionized it with her daring creativity. Recognized by experts as the nation’s preeminent Navajo basket weaver, Mary’s pieces are highly valued collector’s items. Her story is worth telling. In 1960 there were only about a dozen active basket makers on the Navajo reservation. Most women had turned to the more profitable art of rug weaving. One of those basket weavers was Mary Black. Taught to weave by an elderly relative when she was 11, Mary has spent over half of a century creating baskets for sacred ceremonial purposes as well as the art world. Mary was one of the first people to consider weaving baskets with imaginative designs targeted toward the Indian art collector’s market. Many of her baskets depict traditional beliefs, stories or legends. Some are inspired by Navajo sandpaintings. Mary Holiday Black is indeed a treasure, and we are honored to count her as a friend. We at Twin Rocks are honored to offer her baskets and help keep the fusion of Navajo tradition and cutting edge art alive. The Southwest Recipe for Navajo Frybread. Enjoy! Treat your Friends with this Recipe for Navajo Frybread. Whether you are a foodie from New York City or Los Angeles, or a Midwesterner taking a leisurely Southwest tour in your RV, you will fall in love with Navajo Frybread. That’s a promise. What do you do when you get back home and can’t find Indian Frybread at your corner deli? Here we present you with a recipe for frybread. Hooray! Mix the flour, baking powder and salt together. Pour in the warm water and mix. Knead the dough until it is soft (but not sticky), and add a little more flour or water as needed. Put the dough in a bowl, cover it, and let it sit for about 15 minutes. Divide the dough into 12 balls, and roll each one until it is about 5 inches across. (This is totally up to you – you may want to go for a piece of frybread that is twice that size. Make yourself happy!) Whatever size you make the circles, the dough should be about ¼ of an inch thick. Now, poke a small hole in the center. Heat your oil in a deep and, preferably, heavy pan. A large cast iron skillet works well. The temperature of the oil should be about 375 degrees. Drop the bread, just one at a time, into the hot oil and turn when the frybread is gold. Serve with butter or, our personal favorite, a good, local honey. Or use the frybread as a base to make a Navajo taco. Warning: Indian Frybread is addictive. Enjoy, and treat your friends to the food you discovered while traveling through the Southwest! Dancing Kachinas Wish you a Happy Autumn!